DiAnne Karas, Village Green Drive resident and business owner, spoke against the rezoning request during a public hearing at the Sidney City Council meeting held Monday evening. The hearing was for a rezoning request to change an R-2, single and two-family residential district, to an R-3, multi-family residential district on Wapakoneta Avenue. Developer James Hunley, with Sunset Development, seated three to the left of Karas, hopes to build multi-family housing development if a parcel of land is approved to be rezoned. The request will return for a vote on Jan. 28. SIDNEY — A public hearing was held during Monday’s Sidney City Council meeting for a rezoning request of a parcel of land on Wapakoneta Avenue. The rezoning request of Sunset Development, on behalf of Russell Road Church, is for a parcel of land located on Wapakoneta Avenue, south of Hoewisher Road, from an R-2, single- and two-family residential district to an R-3, multi-family residential district. This would allow for multi-family residential housing to be built on the land. The public hearing was coupled with council’s introduction of an ordinance for the rezoning of the 10.018 tract of land. The Sidney Planning Commission held a contentious public hearing on the rezoning request in December. It resolved to recommend for City Council to deny the request, despite city staff’s suggestion for the commission to recommend council to approve the rezoning. In December and again Monday, Barbara Dulworth, community development director, said the city’s comprehensive plan recommends the area, identified as policy areas eight and nine, north of Russell Road include a focus on commercial, service, office and multi-family uses on the underdeveloped property. Recommendations for policy area nine, the northern portion of the Wapakoneta Avenue corridor, are for development and re-development activities focused on non-residential uses. Appropriate land uses include commercial and office uses along the frontage, planned mixed-uses that could include multi-family residential, and public and semi-public uses. As with the December Planning Commission meeting, Council Chambers was overflowing with residents pouring into the hallways. Council set up an intercom system so people in the hallways could hear inside chambers. The demeanor of the 80 to 100 attendees was much more reserved on Monday than December’s public hearing. Prior to the start of the meeting, Mayor Mike Barhorst gave an overview of the rules. He cautioned for people to be respectful, withhold clapping and booing and please not repeat the same comments already made. He also requested for attendees to keep comments to three minutes and to potentially circulate out after they had spoken to allow those in the hallway to make their way to the microphone. Developer James Hunley, with Sunset Development, was the first to speak to council. Hunley said there was a lot of discussion at December’s public hearing about his project to develop on the land, aside from the rezoning request that was before the commission. “Part of what was missed in that discussion is that obviously a rezone is a permanent rezone. And whether my project goes forward or not, the zoning of R-3 would be there permanently for somebody else to do a higher density project,” Hunley said. Sunset wants to rezone the area, Hunley said, because it would be “more effecient” from a cost and density standpoint and maintain more green space and trees. The development would include about 50 connected town homes of six to eight unit strips. It would also include two, 1-acre commercial pads, which was recommend by city staff, as it would fit well with the city’s comprehensive plan for the future development of Wapakoneta Avenue, he said. It would also include a 100-foot buffer from the rear of the development to the back property line. As with December’s public hearing, most of the people who spoke out were against the R-3 rezoning request. Comments and questions asked how Sunset plans to finance the project and if they would be receiving a low income tax credit. One resident argued that if Sunset receives a low income tax credit, that means it is low-income housing. Another asked if Sunset would be instituting 811 housing, which is different from Section 8 housing, the resident said, but is still a form of low income housing. Hunley said if Sunset is awarded low-income credits, they will sell some of those credits typically to banks, which then become partners, or investors. He explained the 811 program will allow for a rental subsidy on five or six units for disabled renters only. “There is no other rental subsidy in the program. This is not section 8 housing. It is a misnomer that this is section 8 housing. The rent is set based on the affordability levels of the incomes of the folks that live there,” Hunley said. Hunley told Council member Joe Ratermann, when asked, Sunset’s housing market study to determine the need for housing in Sidney, had not been completed yet, but will provide a copy to council after it is finished mid-February. Two people spoke in favor of the rezoning request. A female in favor of the request said other multi-housing units are near and reiterated this development is not low-income housing. Russell Road Church’s Senior Pastor Fredrick Gillenwater, also spoke in favor of the request. Gillenwater said he felt it would be a help to the community and would not lower neighbor’s property values. This comment drew laughter from the crowd, which was a rare break from the overall silence throughout the meeting. After all public comments were made, the public hearing was closed and Barhorst told the crowd the item would appear for a vote at the Jan. 28 meeting. 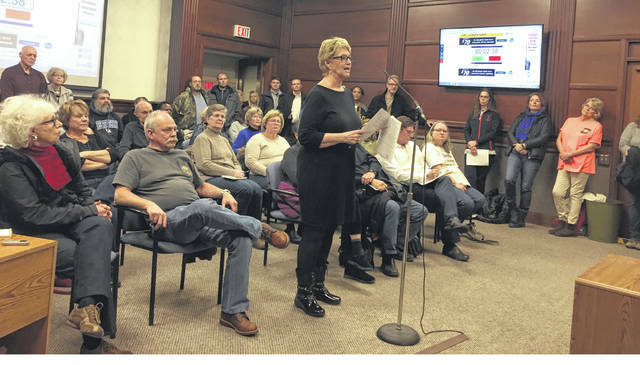 https://www.sidneydailynews.com/wp-content/uploads/sites/47/2019/01/web1_rezoning.jpgDiAnne Karas, Village Green Drive resident and business owner, spoke against the rezoning request during a public hearing at the Sidney City Council meeting held Monday evening. The hearing was for a rezoning request to change an R-2, single and two-family residential district, to an R-3, multi-family residential district on Wapakoneta Avenue. Developer James Hunley, with Sunset Development, seated three to the left of Karas, hopes to build multi-family housing development if a parcel of land is approved to be rezoned. The request will return for a vote on Jan. 28.